For many people searing Asian temperatures are something of an appetite killer (would that I were one of them). Even after a day of meandering around temples or browsing markets, come dinnertime the ravening hunger that one might look forward to satisfying on a cold winter’s day just isn’t there, and the idea of sitting down to a full meal can be somewhat off-putting. Praise be, in that case, for tapas. Tapas platter from Picasso... que rico! The origins of the Spanish tradition are unclear, and there is a thoroughly unsavoury association with the Spanish expulsion of the Jews in the 15th century when small plates of pork tapas were allegedly used at gatherings in order to expose those who had converted to Christianity in order to avoid expulsion, or worse. Such uncivilised beginnings, but nothing and no-one is beyond redemption, especially if it’s actually just food. 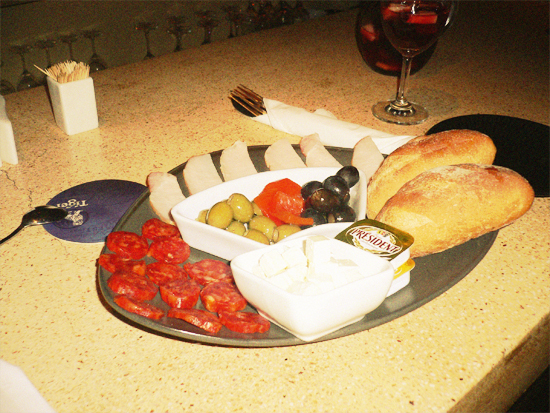 The joy of tapas is that you can order as much as you like, and the emphasis is on being able to chat while you eat. For tapas in true Spanish style head to Picasso, a small sort of hole-in-the-wall Spanish wine bar on Alley West whose arched brick walls and elongated round bar conspire to create an atmosphere of intimacy and conviviality. Picasso offers beers, a short wine list and sangria, of course. A short tapas menu includes patatas bravas, real jamon, olives, feta cheese, roasted peppers and a number of other deliciousnesses. For a more liberal take on the tapas principle, then head to Ivy 2 on Friday nights or Soria Moria on Wednesdays, both of whom offer a tasty selection of small plates from all over the world. And, if that is not enough to draw you in, they do at them at a margin-squeaking $1 a plate. Ivy 2’s menus change each week, and you can find on there a choice of Asian and Western dishes, meat and vegetarian, including mini beef tacos, Chinese chicken wings with sweet soy sauce, fried sweet potato with cumin mayonnaise, or mini veg samosas with yoghurt-mint sauce. Their desserts are a massive hit, especially the chocolate mousse. At Soria Moria, the Wednesday night tapas nights are a training night for young adults who are registered with a number of local NGOs in Siem Reap, and part of the hotel’s extensive social programme (they’ve just been nominated for a Tourism of Tomorrow Award from the World Travel and Tourism Council). Dropping in and dining out is a neat way of contributing to the development and confidence building of young teenagers. The tapas menu includes some old favourites such as spare ribs, bruschetta, spring rolls, chicken satay, sausage rolls, meatballs, garlic bread, chicken nuggets, potato skins and samosas. How can you say no to all that?